So often, history textbooks begin with Mesopotamia and the farmers of the Fertile Crescent as the beginning of history. It may be true that the beginning of recorded history starts with them, but those early civilizations were hardly the beginning of history. This year we seek to go back…WAY back to the very beginning. This year’s focus in on Prehistory, Geology and Evolution. We are going back in time to learn about the origins of the Earth, and all the wondrous life that has called it home. We’ll start at the very beginning and work our way up to the dawn of man. We’ll be using the gorgeous full color DK books, Prehistoric Life: The Definitive Visual History of Life on Earth and Evolution: The Human Story as our main spines, as well as several well written books to help us dig deeper into the material. Our science focus this year will be the book A Short History of Nearly Everything by Bill Bryson. This delightful and fascinating book covers a wide array of scientific topics, from biology, to geology to astronomy and more; but the heavy focus is on how science works, and how scientists know what they know (and what they don’t know). We’ll round out our studies with a few well-chosen additions, like The Sea Around Us, Special Edition by Rachel Carson and The Sixth Extinction: An Unnatural History by Elizabeth Kolbert. We’ll also be delving into the world of literary analysis using the book How to Read Literature Like a Professor by Thomas C. Foster. I created a study guide for your student to use as they read through this book. In addition to this delightful and entertaining text, they’ll also be using the consumable workbook Figuratively Speaking , which covers 40 literary terms, from Alliteration to Irony to Foreshadowing. By the end of this course, your student will be ready to tackle the classics. We’ll also be studying poetry – learning to appreciate poems with Poetry 180: A Turning Back to Poetry by Billy Collins and understanding how poetry works (and learning to write our own) using A Poetry Handbook by Mary Oliver. And of course, your child will enjoy some well chosen novels, from classics like Shakespeare’s The Taming of the Shrew, to epic fantasy like Lord of the Rings, to modern classics like Flowers for Algernon. Living literature is always the meat and potatoes of this curriculum. My lesson plans guide you through the Level 9 school year effortlessly. Your planning is done for you so that you can spend your time on the important things, like teaching your children. 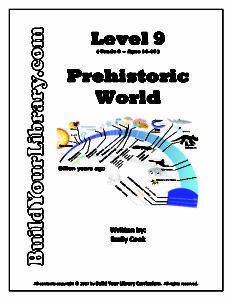 Have you already purchased Level 9 – Prehistoric World? We would love to hear what you think and share your experience with others – Please feel free to leave a product review on the Contact Us page! Thanks for your support!